The white High Chaparral-The Opera House filly sold for $450,000 on the first day of New Zealand’s Premier Yearling Sales at Karaka, on January 25. The pure white thoroughbred filly offered at New Zealand’s Premier Yearling Sales at Karaka today has sold to a buyer from Japan for $450,000 ($US293,000). The filly, by High Chaparral and out of the white Zabeel mare The Opera House, was bred by Windsor Park Stud, which has a white half-brother to the filly by Shamexpress at home. The white filly was bought by Japanese businessman Hideo Takadaru, who was happy with his purchase after travelling to New Zealand specially to secure her. Takadaru came out best after a bidding war with David Ellis, and the final fall of the hammer exceeded the expectations of her breeders. “I saw several videos of her on the internet and became interested in her. I liked what I saw and decided to see if I could buy her,” Takadaru said. Samantha Brooks, PhD, assistant professor of equine genetics at Cornell University, says white horses are basically “genetic mutants“. Her research indicates that there is a gene called KIT in which any one of about 20 different mutations could occur that would result in a white or partially white coat color. “They cause both dominant white horses, who are fully white, and then they also cause some more variable white phenotypes, ” Brooks said, referring to horses with patched coats. 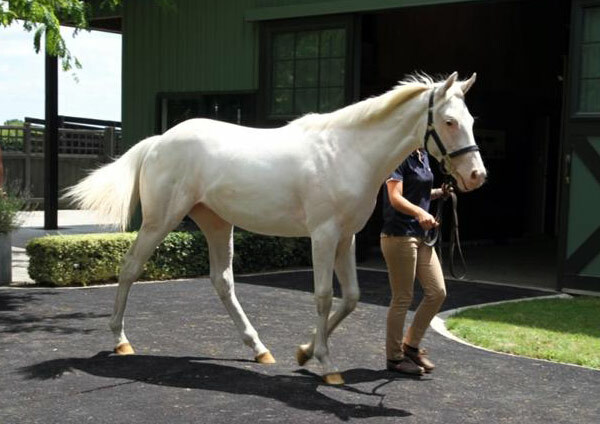 “Many of these spontaneous white horses will have a KIT mutation. “We think they are spontaneous, novel mutations in most cases because usually, once they appear, are dominantly inherited so they wouldn’t be able to hide for many generations, waiting for the right combination to appear,” said Brooks. For this reason, a gray horse isn’t any more likely to throw a white foal than a bay, since the gene for gray coat color is in a completely different location from the KIT gene.